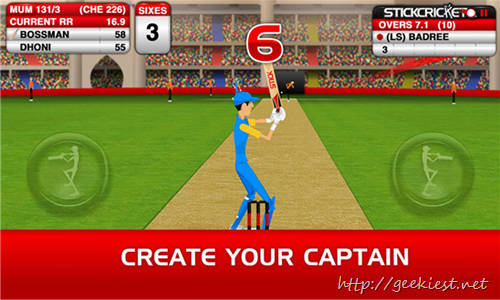 Stick Cricket Premier League is a famous Free game available for Android users. Now the game is also available for the Windows Phone users. You can create your team, sell and buy players with other teams, choose background staffs etc. and play different leagues and win trophies. You can choose from 50 famous cricket players to make your squad. You may also get x-player or if you need an experienced player with your team. TRAVEL THE WORLD - From Mumbai to Melbourne, your skills are in demand! Team owners in India and Australia are battling it out to secure your signature. BUILD YOUR DREAM TEAM - Your owner will bankroll the recruitment of Star Players from around the world, boosting your chances of winning the League. ESTABLISH A DYNASTY - You’ve got five seasons to establish your team as a force in the Premier League. Your success-hungry owner will want five trophies... just don't end up with the dreaded wooden spoon instead. RECRUIT COACHES- Hiring a batting coach will soon have your created captain slogging it like a Star, or reduce the runs your team concedes with the expert guidance of a bowling coach. ENHANCE YOUR SIX APPEAL - The crowd wants maximums! Each League provides cash bonuses for every six you smash, as well as stumping up an appearance fee. You read that correctly: cold hard cash, just for showing up! You need to have Windows Phone 8.1 or Windows Phone 8 to play this game.